For days when you feel like you're in an art rut, simply out of ideas or just plain bored, here's a rad, instantly inspiring DIY drawing project to keep in your back pocket. 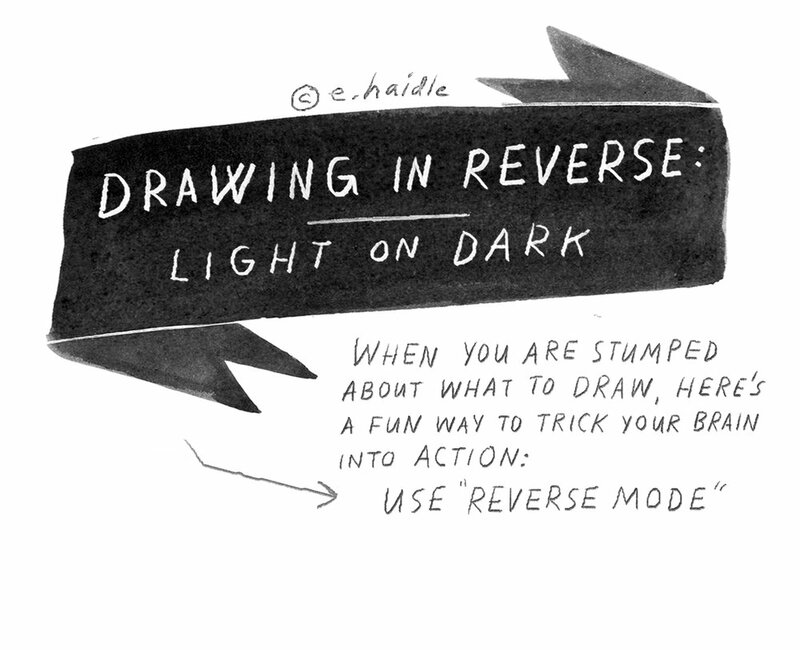 Have you ever tried drawing.... in reverse? Sounds strange and even a little intimidating, but it's actually a fantastic way to spark your imagination without breaking a sweat. By using an eraser to draw instead of a pencil or pen, your page suddenly becomes a playground for zany, totally original ideas, doodles, and experimental drawings. Grab your eraser and get ready to look at the world in a whole new way! Larger placemat, newspaper, or something under your project…it can be a tad messy! 2. Lightly brush any excess powder away by whisking another tissue across the surface. The graphite should be kind of ‘scrubbed into’ the paper, like a stain. 5. Now add finishing details in pencil or pen. You can even overlay thin watercolor washes on top of the erased spaces or the graphite-tone parts, just be aware that the moment you put water down, it’ll fix your image on the page in a permanent way—no longer erasable. Love this DIY project? Check out our Instagram Giveaway to win Elizabeth Haidle's completed piece from the DIY video (pictured above) ! More details on the giveaway can be found here. And stay tuned for more black-and-white themed DIY projects in our next ILLUSTORIA Issue #8: Black and White, coming oh-so-soon.